Well done Freddie and Ollie! On 28-Nov-2015, Wendens Ambo U7 entered two teams of in the London Festival of Rugby at Twickenham Stadium, the home of England rugby; hosted by Saracens rugby club. All the kids played some super rugby in what was their hardest competitive fixture yet. Everyone had a great day, and in typical form the U7 squad showed amazing grit and team spirit against some tough competition. After qualifying rounds at Richmond College in the morning, the children were able to watch Saracens beat Worcester at Twickenham 48-18 in the afternoon. At half-time qualifying teams were able to play on Twickenham itself in front of the 42,000 strong crowd. 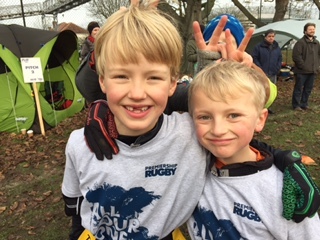 Freddie Hill and Olly Dyster (Yr 2) were there from Clavering school, playing for the Wendens Knights. The Knights really stepped up to the mark on this big occasion. They went out strong and determined and won their initial game, albeit only by a small margin, they then went on to draw the 2nd game and win the 3rd. It was obvious from the outset that this was going to be their toughest set of games to date. It could have been quite daunting for our boys watching the other visiting teams coaches putting their teams through constant pre match drills and strategies, all looking very polished. Not at all though, the team took in the atmosphere, relished the pressure and when the start of the match whistle was blown they were immediately in the zone. Throughout the three qualifying games every member of the 6 person team rose to the occasion and played their hearts out. All the skills and experience they had developed to date fell into place and some majestic rugby was played. At the end of the qualifying rounds we were delighted to hear Wendens Ambo Knights had made it into the finals to be played on the pitch at Twickenham during half time of The Saracens/Worcester match in front of a crowd of 42,000 fans. High excitement for the kids and great pride for the families, friends and club. Their final game was against Roslyn Park, a very mature, experienced club; well drilled, professional and a little intimidating. Not for our fearless team though as every child contributed to the success, in attack they displayed quick feet and trie scoring ability from the likes of Ollie, Freddie and Olly; superb tagging skills by Robina and Tom; and outstanding commitment by Magnus who was always in the face of the opposition contesting possession. They all played well and played as a team. They all contributed to the score line, performed fantastically in support and defence and very importantly they showed humility, sportsmanship and respect to the opposition at all times. This is one day the children won’t forget, they did the club proud and most importantly they did themselves proud. All whilst having fun doing what they enjoy. The score…? Oh yes. They WON their final….